The architect, with his champagne, was not celebrating that the above was built, it opened last May. 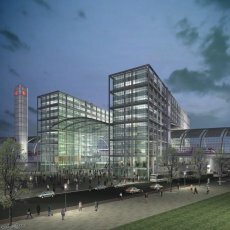 This is the new Central Train Station in Berlin It’s the largest in Europe. But apparently it might have also been a more profound piece of architecture, both aesthetically and functionally. “The prize-winning design by Gerkan, Marg and Partners with two towers looking over the curve of the station roof, promised to become Berlin’s architectural landmark of the twenty-first century. It was to claim its place in Berlin’s long and famous tradition of artistic industrial architecture – from Peter Behrens’ AEG Turbine Factory and Josef Paul Kleihues’ workshop building for the city refuse disposal services through to Oswald Mathias Ungers’ sewage pumping station…. “130 metres were to be simply lopped off the length of the 450-metre glass roof. …As the office towers grew, the calamity became more obvious with every passing day. The interplay between the length of the ribbon of glass and the height of the towers, originally in a charged equilibrium, now insults any sense of proportion. One can imagine what a cinematic effect the trains would have offered, accelerating out like bullets from a gun. Now they will just chunter off into the open air. “… neither time nor money justified the shortening…. For generations to come, the monstrosity of Lehrter Bahnhof will remain associated with the name of its disfigurer. In Hamburg they have never forgotten how Kaiser Wilhelm II stopped the original design of their main station with a flourish of the imperial quill. 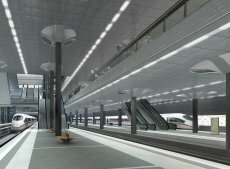 “Yesterday the Berlin District Court ruled in favour of the architect Meinhard von Gerkan, who sued the German rail company Deutsche Bahn for building a bastardised version of his designs for the subterranean level of Berlin’s new main train station, the Hauptbahnhof, which opened on May 28 this year. 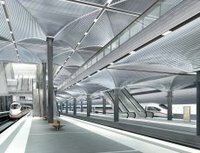 “The thousands of rail travellers who pass through Berlin’s Hauptbahnhof every day value architectural aesthetics as much as the price of train tickets, something Deutsche Bahn chairman Hartmut Mehdorn and his colleagues blithely ignored. – Dieter Bartetzko in the Frankfurter Allgemeine Zeitung. THE HUMAN RIGHTS OF THE EYE! Can you imagine what von Gerkan would think if he tried to build a train station in America? lol and see next post! You are currently browsing the archives for the von Gerkan category.